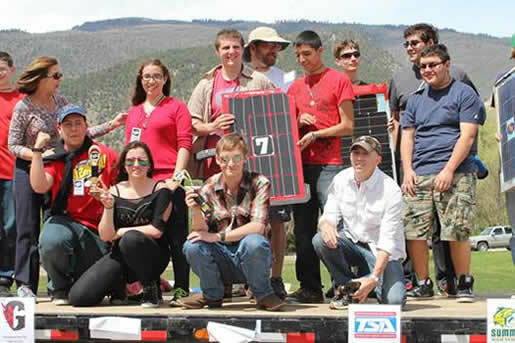 Battle Mountain HS Wins Solar Race! He said that the team was closing in for the lead when the car was hit hit again by another racer, this time knocking the front bumper completely off and exposing the car’s solar cells to permanent damage. “Our team fixed this issue,” Lewandowski said, “and then made a critical decision that helped us win: they positioned team members around the entire track to ensure the fastest and most efficient repair time.” Ultimately, he said, after more than 150 laps and 60 minutes of hard racing, the BMHS team caught up, surpassed all more experienced competitors, and won the race. “It was awesome!” Lewandowski said. The team’s members included George Jouflas, Maria Burrell, Eduardo Ochoa Moreno, Megan Fregoso, Luis Loya, Guillermo (MeMo) Gonzalez, Lang Austen, Aaron Pena, Koby Simonton, Corson Fullhart, Drew Feeney, and Kenny Vargas. Congratulations to the Battle Mountain team! Previous Previous post: 2014 COTSA State Conference a huge success!